​With a background in theatre design, my interest is in colour and how colours interact. I now work primarily with paper collage, making bright abstract images in bold blocks of flat colour. ​I also work on canvas, where flat abstract images echo their paper collage origins, and/or paper collage is incorporated onto the surface of the canvas. These are dynamic, optimistic contemporary images which have also been described as ‘monumental’, regardless of their physical size. Many of my works are also available as limited edition reproductions. I also make stained glass panels, because colour in glass has a brightness, purity and saturation that outshines any paint. There is no stronger colour than stained glass with bright sunlight behind it! 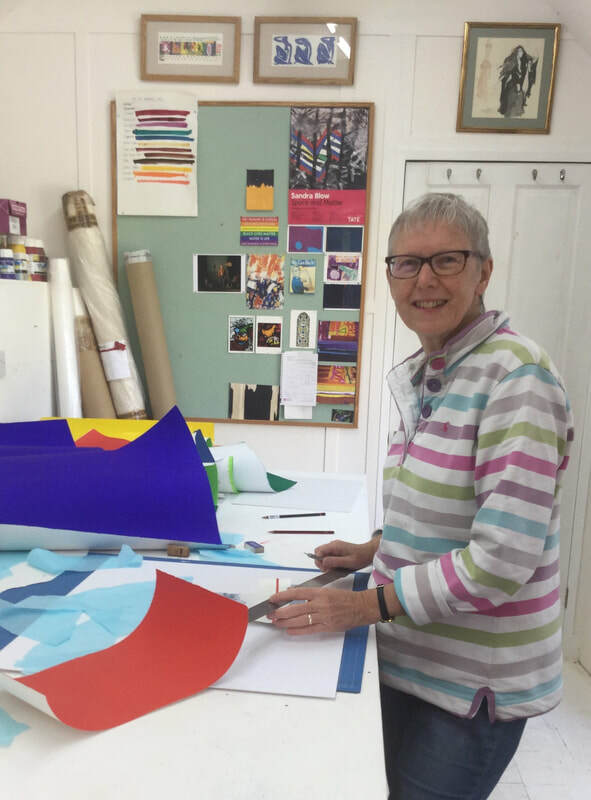 I have run 'hands-on' courses and workshops for many years and currently offer workshops on creativity, paper collage and stained glass.